It's true! Elephants don't forget! 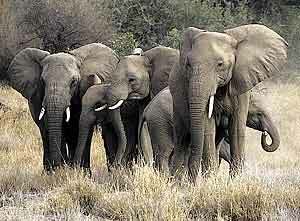 Elephants are the largest of land mammals living in very advanced social organisations that require good levels of communication between the groups of individuals. This is because they live in a "fluid fission-fusion" society which simply means that their family units are constantly being divided and reunited whilst, at the same time, they are meeting different individuals on a daily basis. This requires an advanced level of communication and recognition to allow individuals to mediate between the complex relationships that they develop with other individuals. Social organisation in elephants is characterised by their closeness and intimacy and is divided into three forms. The most important grouping is the "family unit" which consists of two or more related females and their offspring (See Fig 1). Male bulls are not part of this family unit but either aggregate together or solitary. A family can range from 2-50 individuals and they interact together in an organised and coordinated manner. Such interactions include teamwork, offspring care, group defence and resource acquisition which all involve decision making, normally made by a powerful "matriarch". The matriarch is a dominant female leader within the group who is the oldest and thus the wisest and most experienced. She makes the decisions regarding movement, safety and resource acquisition. "Bond groups", otherwise known as a "kinship groups", are groups of individuals that are closely related genetically. These groups form when bonds in a family are weakened and thus divided by fission. In this case, all young calves are treated equally and are allowed to suckle from other nursing females within the group as well as their mother. Juvenile females act as "aunts" whose role is to make sure the calves behave by preventing them from running ahead of the herd and waking them up after a mid-afternoon nap. members of the herd from danger. 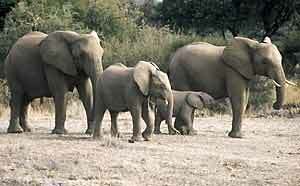 Thus, combined parental care is one major factor in elephant social organisation. This is an extreme sort of altruism where an individual is not just exposing herself to danger for the sake of another kin, but is increasing the fitness of up to 50 individuals. Communication is an essential aspect of social behaviour in elephants and this is achieved by the efficient use of all their senses. This is important as it enables a herd to keep track of their relatives, defending territories and alerting the group of danger, as well as conveying their reproductive state and associating females with their young prior to weaning. Thus, they require a long distance network of communication due to this fluid social system which can convey information about their physical and emotional state as well as transmitting their intentions. or Return to Wildlife Articles.